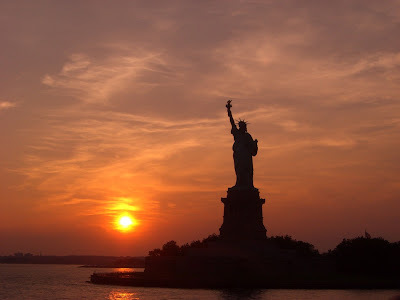 Statue of Liberty at sunset. Because seriously, can you ever really get enough of her? Thank you France! 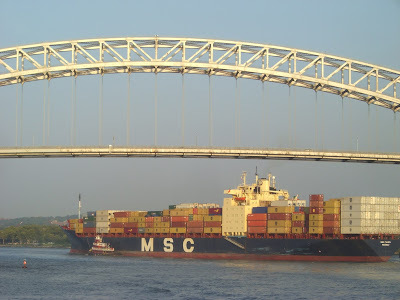 Here's a cargo ship going under the Bayonne Bridge (which connects Staten Island and New Jersey). Approximately 10 ships of this size or larger enter New York's ports everyday to unload cargo from across the globe. Each of the larger containers is 40 feet long and ships will hold about 2000 of them. Due to trade imbalances, over half of the ships will return to their country of origin completely empty. This ship is leaving either empty or with very light cargo, as it is riding very high up on the water. Ships are getting larger and larger and may pose a serious problem if they become too tall to pass under the bridges. The waterway was dredged to make it deeper but the bridges pose a potentially unsolvable issue. 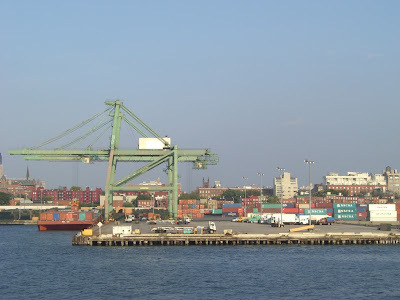 Here's a shot of the working cargo docks in Red Hook and one of the giant gantry cranes that is used to lift cargo containers off the ships- as viewed from a boat on the water. As you can see, the cranes are taller than just about everything in the surrounding neighborhoods. 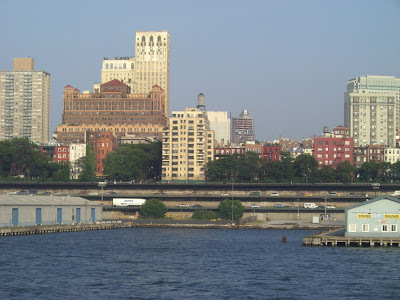 Here's another in my Brooklyn as viewed from the water series (part 1). The real story of how these shots came about is that I took the Hidden Harbor Boat Tour provided by the Working Harbor Committee. 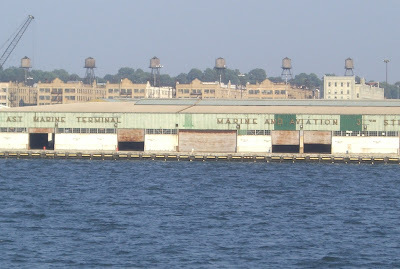 The tour went around to many of the working areas of New York's harbors, including the Red Hook docks and areas in New Jersey just off Staten Island. It was fascinating to see how much freight comes in to the area via ship without most of us noticing. I find it interesting how there's just layers of activity (and there's even much more below the surface that can't be seen) coexisting in a tight space, yet out on the water in the foreground there is a vast feeling of emptiness. 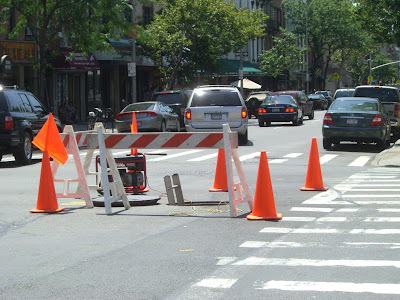 You probably didn't hear about because there's a major cover up by the city and MTA. But trust me, a subway car on the R line ended up floating in New York Harbor for most of the day. At least we had a lovely view of the Sunset Park Marine Terminal. Some guy in the back of the car was trying to catch fish for us to eat for lunch- he caught a few Coney Island whitefish, which frankly didn't taste too bad sashimi style. Glad to be back on dry land again. 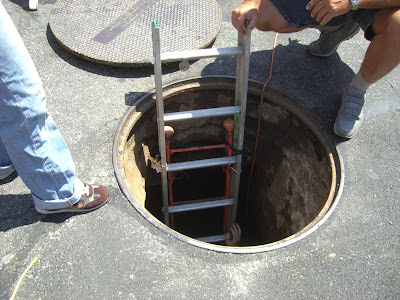 You carefully cross into the middle of the intersection and make your entrance down a ten foot ladder into a maybe 50 foot long tunnel with low ceilings, dirt floors and pipes you must duck under. The tunnel is massive! It goes on for about a half mile directly below Atlantic Avenue. 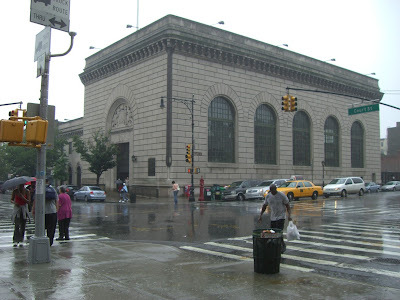 It was built in 1844 by the Long Island Rail Road and sealed up in 1861 under a complex series of events that led to the building of Park Slope and the tunnel not being destroyed as it should have been. 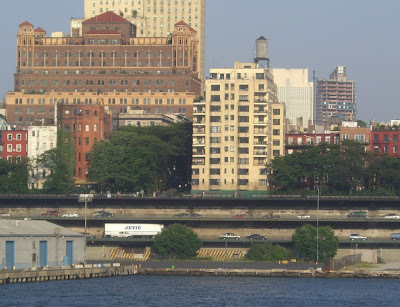 The lower part of the tunnel is made of huge blocks of stone taken from Manhattan (near the UN area) while the upper part is an archway of brick. 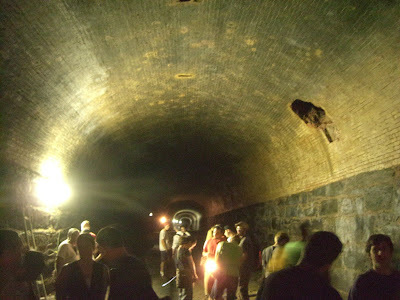 Visible on the brick is soot from the steam locomotives that ran through this tunnel. The hole in wall at right in the picture below is from the FBI, who broke through in 1916 under suspicions that the Germans were hiding munitions in the tunnel. Nobody set foot in the tunnel again until 1980. In 1980, after much research, Bob Diamond (pictured below), rediscovered the location of the tunnel entrance which many believed did not actually exist. 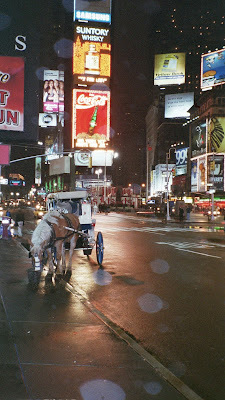 Much of his evidence came from old newspaper articles, including some written by Walt Whitman. The story is fascinating and Bob leads the super informative tours under the auspices of the Brooklyn Historic Railway Association. 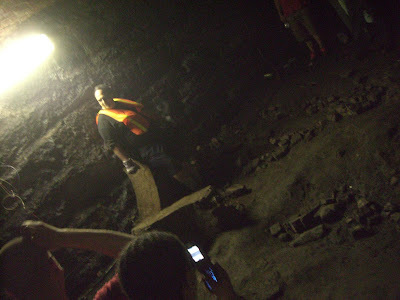 The tour gives you a wealth of fascinating historical tidbits. 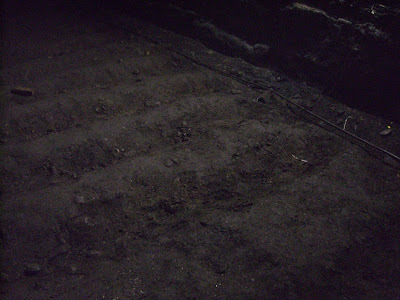 The floor of the tunnel is dirt but still has bumps where the rail ties for the train tracks used to be. At the far end of the tunnel is another sealed off wall. Bob believes that behind the wall is an intact locomotive from the 1840's. Bob and the BHRA are trying to get the tunnel reopened for trolley use as part of a larger system of transportation in the downtown Brooklyn area. He's a great storyteller and the I'd highly recommend the tour for anyone interested in a missing piece of local history. 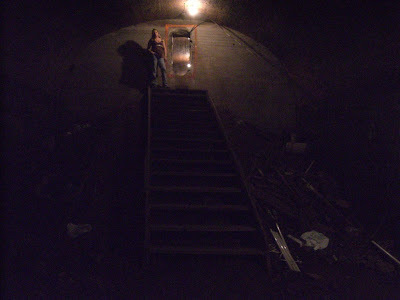 Bring sturdy shoes and a flashlight!